When the NYDJ team reached out to me to work together on a collaboration, I was thrilled to try out something new and share with my readers. I naturally gravitated to black trousers, but after seeing the selection of petite denim, I wanted to share a few of my favorite styles that could be worn day to night. Finding the perfect “work jean” has always been something that I’ve struggled with during most of my career. While most of the office wears denim on casual Fridays, I’m typically found in my trousers or a pencil skirt. It’s not that I find anything wrong with denim at the office, I’ve just never found a pair of jeans that were appropriate to wear in front of my colleagues. Most of my jeans are either distressed in the legs or a little too snug to feel comfortable wearing into a meeting with my manager. While browsing through the NYDJ dark wash denim, I found the Billie Mini Bootcut jeans – also known as the perfect work jean! These jeans work for a casual Friday at the office because they’re a dark wash denim and they’re slightly narrower leg than your typically bootcut jean. I’m wearing the Billie Mini Bootcut jeans in petite. The jeans fit true-to-size and allow for a little for movement with a blend of cotton, polyester and spandex. 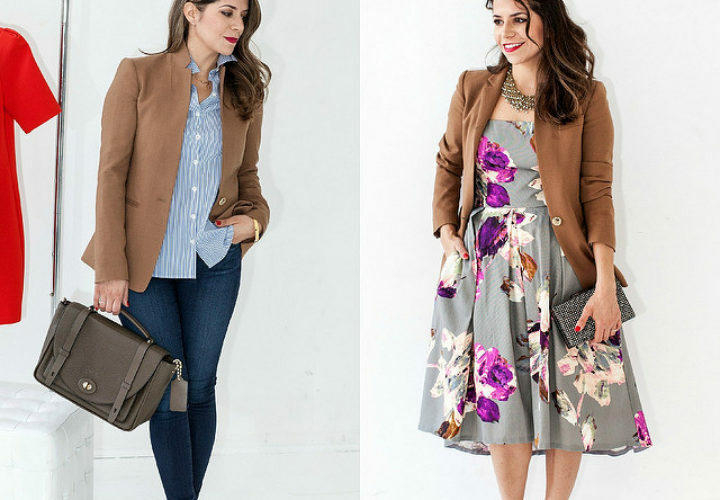 I chose to wear my signature look – cami, blazer and stilettos to complete my Casual Friday office look! I also wanted to try NYDJ denim for an evening look. I paired the Alina Leggings in Petite with an off the shoulder top and statement earrings for a night out with your girlfriends. The Alina leggings hit my foot at the same place as the Billie, so I decides to roll up the denim for a less structured look. They have a wide selection of denim for all shapes and sizes, they have dedicated sizing available for petite (YAY! ), plus and tall. Typically I’m hauling 2-3 pairs of jeans to my seamstress to get the hem taken up a few inches, so most jeans automatically have an 25% markup after I buy them from retailers. The petite selection offers a variety of washes, styles and selections. Thank you to the NYDJ team for sponsoring today’s post! Best look. I love first one Denim with blazer…. This looks is so nice and fashionable.